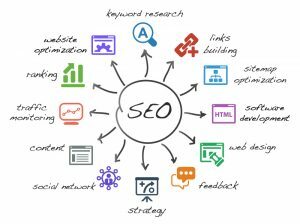 Good Web Design can make your business website more accessible and appealing to customers with online marketing techniques in accordance with the Google Webmaster Guidelines. People often go to Google to solve their problems, find products and services and research buying decisions. With our help it can be your website they find more often. In the past people would solve their purchase requirements with the yellow pages, now they use Google and other leading websites. The three pillars of current online marketing are Google Adwords, Google Search and Facebook Ads. We highly recommend a combination of paid Google ads and SEO to get more enquiries. A well built website that ticks all the boxes for search engine optimisation can reduce your cost per click and when coupled with a carefully managed Google Adwords campaign can help you stand out from your competitors online and get new enquiries. All our SEO clients get monthly activity ranking reports and analytics to see how the work is progressing. SEO is not a quick fix but it is good to see the gradual improvement which motivates further work.